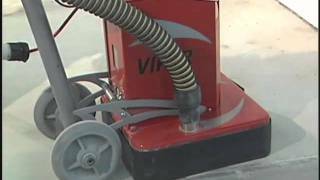 (PRLEAP.COM) January 9, 2013 – Vancouver, BC - WerkMaster™ Ultra Floor Systems, a leading manufacturer and provider of concrete surface preparation equipment is chosen over 20 other concrete grinder manufacturers as the preferred choice of LINE-X Protective Coatings. LINE-X introduced ASPART-X Flooring Solutions in 2010 as the premiere polyaspartic coating for concrete surfaces. ASPART-X provides ultraviolet (UV) protection that does not yellow or fade; will cure in all weather conditions; has a fast cure speed and offers excellent abrasion and chemical resistance for garage floors, patios, decks and countless commercial and industrial flooring applications. In recognition of these attributes, ASPART-X won the 2010 Popular Mechanics Editor's Choice Award for Best Garage Floor. "LINE-X contracted the University of Alabama in Huntsville to do an independent study of over 20 concrete grinder manufacturers," stated Brian Wilson, President of WerkMaster. "The criteria included: Ease of Operation; Grinding Close to the Wall; Ease of Loading and Unloading from a Trailer; Ease of Changing Diamonds; Ability to Flatten a Floor or Follow Floor Contour; Cost of Diamond Tooling; Production Rate; Electrical Requirements; Overall Performance." George Rittenhouse, Research Scientist for the University of Alabama in Huntsville who led the evaluation project stated; "the Viper is the leading grinder in my evaluation criteria!" WerkMaster scored 4.2 out of a possible 5 points with its closest competitor scoring a rating of 3.2 points. "We are excited to add WerkMaster's complete line of concrete surface preparation machines into the ASPART-X Flooring System," stated Mark Lunde, VP Commercial/Industrial Development for LINE-X. "It is very important to have a properly prepared surface to ensure maximum physical and chemical bonding of the ASPART-X coating. WerkMaster's unique Octi-Disc technology delivers a superior scratch pattern providing maximum adhesion allowing us to offer a 5 Year Limited Warranty on our installation." 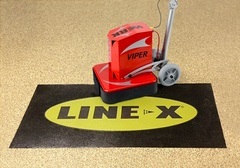 Available throughout the company's network of over 400 professional, franchised centers in the United States, LINE-X continues to lead the marketplace with innovative products that provide unique solutions to customers. By partnering with WerkMaster, LINE-X is working to provide the best surface preparation possible. "We are constantly looking for ways to improve our technology" stated Wilson, "moving forward in the industry with a goal of providing the best possible solution to our customers. LINE-X and WerkMaster are equally dedicated to providing our customers with superior customer service and improving on our commitment to them." LINE-X Protective Coatings (www.LINE-X.com) is the nation's leading developer and provider of high performance protective coatings offering scientifically formulated polymers that permanently bond to a wide range of surfaces for unmatched durability. LINE-X products are utilized in automotive, commercial, light industrial, heavy industrial, agricultural, military, marine and custom applications. Headquartered in Huntsville, Alabama, with more than 500 locations in 46 countries, it is the goal of LINE-X to consistently produce the highest quality and most reliable materials available. Follow LINE-X on Twitter @LineXprotects become a fan on Facebook of LINE-X Protective Coatings and check out what LINE-X is doing on YouTube at: www.youtube.com/linexprotects. WerkMaster™ is proud to be one of the most innovative and effective manufacturers of award winning concrete surface preparation equipment, stone, terrazzo and polished concrete equipment as well as hardwood floor refinishing machines. WerkMaster's floor finishing and countertop tools are really 7 Machines in 1: Edger, Polisher, Grinder, Buffer, Burnisher, Sander and Stripper that edge to within 1/8" or 3mm of the wall.